As stylish as it is durable, this sink by Sinkology makes a terrific addition to any bathroom. It is manufactured with ultra-durable metal, so you can enjoy its stylish appearance even after years of wear and tear. When it comes to improving the overall look and utility of your bathroom, this sink is a top-grade choice. An alluring contrast of shapes defines the Inscribe Wading Pool sink. The deep, circular cast iron basin has gently sloping walls descending to a precisely squared bottom with centered drain. Meet the Freud copper sink from Sinkology. This copper sink is artfully handcrafted from pure solid copper. Featuring specialized undermount design and standard front overflow system, installation is hassle free on this copper sinks. This true work of art comes with a limited lifetime warranty and is easy to clean and maintain, simply wash with soap and water. Bohr 14-inch x 5-inch x 14-inch Circular Metal Bathroom Sink with Drain in Brushed Nickel As stylish as it is durable, this sink by Sinkology makes a terrific addition to any bathroom. It is manufactured with ultra-durable metal, so you can enjoy its stylish appearance even after years of wear and tear. When it comes to improving the overall look and utility of your bathroom, this sink is a top-grade choice. Bohr 14-inch x 5-inch x 14-inch Circular Metal Bathroom Sink with Drain in Brushed Nickel is rated 4.1 out of 5 by 9. 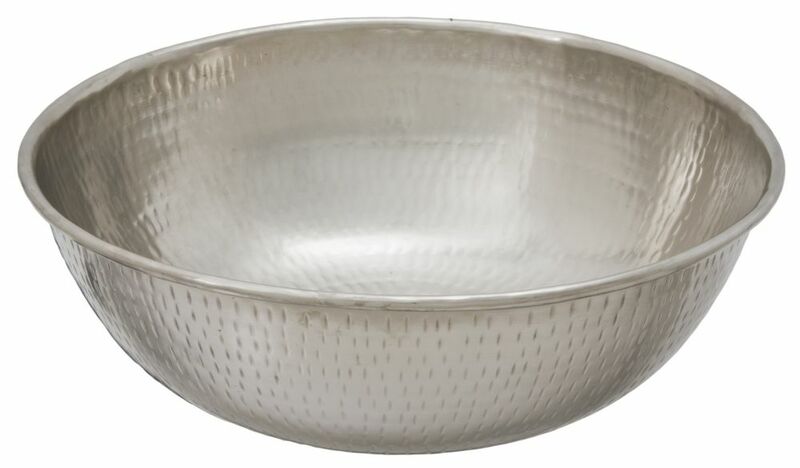 Rated 5 out of 5 by Patty from I was truly delighted with this hammered nickel vessel sink.... I was truly delighted with this hammered nickel vessel sink. I felt it was a true value for the price. Rated 5 out of 5 by Brandie from We purchased this sink for our custom made vanity and it is perfect! We custom cut the drain hole... We purchased this sink for our custom made vanity and it is perfect! We custom cut the drain hole for the sink so installation was very easy. The directions for installation were easy to understand and the recommended pop-up drain plug was also purchased. The sink is absolutely beautiful and is the perfect amount of shine for our rustic barn wood vanity, it really is the focus point when you first walk into the bathroom. We have received a lot of compliments on this sink already! There are special care instructions with this sink which do not seem to be difficult to follow. We have noticed if you rinse the sink out after use (i.e brushing your teeth) there is not much staining left behind. We have soft water so it may be a little more difficult with a hard water household. The price was great, finding a nice sink under $100 is difficult, but there was no sacrifice for quality here. All in all, we love this sink and are very happy with the purchase! Rated 5 out of 5 by Gigi from We are building and it isn't installed yet. I'm giving a 5 star on looks, workmanship and speedy ... We are building and it isn't installed yet. I'm giving a 5 star on looks, workmanship and speedy reliable service. Hopefully I can update with picture. Rated 4 out of 5 by jb from Love it, bigger than I though it would be, nice finish. Only down side is the required tapper in ... Love it, bigger than I though it would be, nice finish. Only down side is the required tapper in surface it mounts too. I had to get a router bit for that. Rated 2 out of 5 by Heather from It is a beautiful sink. It was just too big... It is a beautiful sink. It was just too big for the bathroom vanity. Rated 5 out of 5 by RVlady from Fit perfect into RV space, after my glass sink shattered. Fit perfect into RV space, after my glass sink shattered. Rated 3 out of 5 by Camille from As described in picture but the faucet was not included... As described in picture but the faucet was not included as it stated in the description. Rated 3 out of 5 by Sandy from I haven't installed the sink yet. I was not happy when I read the special care this sink requires... I haven't installed the sink yet. I was not happy when I read the special care this sink requires to prevent staining. I put a coat of Turtle wax on it, as recommended, but now must be on guard about wiping out the sink after I use it, and visitors, to make sure I prevent staining. The online product description didn't say that this was a "special needs" sink. It will look good when I install it, and am satisfied with the appearance. In this case they're referring to using a tool to make the hole in the counter top a bit bigger. Our vessel sinks are designed to fit securely into a 2-3/4&quot; inch hole in the counter top which is a bit bigger than the usual drain hole, but the advantage is you don't need a mounting ring. To install this sink you just need a non-overflow drain and the mounting washer that comes with the sink. We recommend an 8&quot; inch high vessel sink faucet.